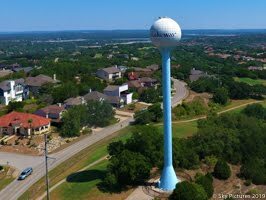 Lakeway Update: Yuk Weather, Council and More! Yuk Weather, Council and More! Howdy! Been a while, took a little vacation from the blog. Can you believe the weather? Cold, warm, and this wet mist and fog. I understand it's going to be mid 70's today and in the 80's before the next cold front. Ugh! As always, the weather station is available - Here's a link and of course there is a permanent link at the top right of the blog page - I don't think mobiles can see that. Hard to take pictures in this weather, but I've had a couple of gigs that have been fun. Here's a picture I took of the Lakeway Airpark in January before the weather became a mess. Changed a lot since it was purchased and turned it into a non-profit in 1995. Still going strong! The City's finances are doing well, money in the bank and a flat tax rate - what more could you ask for? There are flashing signs ordered for Lakeway Blvd. - to let folks know if they are speeding. Chief Radford reported that speeds don't appear to be an issue - more a distracted driver issue. People need to get off their phones and drive. The Police Station project is on time and on budget. Should be pretty much finished this month - then the work of making sure the dispatch center is up and ready to go for the move. Maybe they'll be in sometime in March? A new Associate Municipal Judge was appointed and sworn in, welcome Judge Michele Locke! Council amended the ordinance concerning the Juvenile Case Manager Fund to make it work with the current staff and plan. Council approved creation subject to voter approval of a new Travis County Emergency Services District No. 16. This will go to the voters and is an "overlay" district that takes in a small part of Rough Hollow. If approved, it would allow an additional $0.10 of tax per $100 for those involved. Per the current EMS district they need the money to service their area. Item 10 allowed Lakeway Plaza Partners to combine their properties for the purpose of impervious cover uses. Good plan. Currently the rumor is an office building between the pond and behind Thai Spice. This was previously know as the Reed Tract. 70 acres of property the city owns was re-zoned from AG (agriculture) to PI (Park). This is for the "Sports Park" that will serve our youth and will be built by the county at a cost of about $21M. Another 30 acres was re-zoned from AG to C1 (Commercial) for the property along Highlands Blvd. A general election was called for May 4 to elect a Mayor and 3 Council Members. Mr. Kilgore again spoke to change the terms back to 3 years and go to a "place" system for council. There was discussion but no change made. Will we be sued again? We'll see. Two folks have pulled a package so far - Mayor Sandy Cox for re-election to Mayor and Dwight Haley for Council. A survey was approved for Parks an Rec. and a donation was accepted from the LCC (Lakeway Civic Corporation) for Swim Center Improvements and Heritage Committee mini movies. Citizen's participation went on for quite a while with those upset about the termination of a swim coach. The coach was terminated by 3 employers in the area. I'm sure we'll see more on this soon. Council then retired into executive session to talk wit the attorney about court cases. Two involving a lawsuit with Cherry Knoll L.L.C that has been going on for years. It was thrown out twice by Federal Court in Austin and is now being appealed to the Fifth Circuit. The lawsuit(s) against the City by Tom Kilgore were evidently also discussed along with legal issues about the election issues. Nothing was voted on or discussed when they came out so we'll have to wait and see. Nest week there will be a special session of council to discuss the Hotel Occupancy Tax (education and discussion) and an update on the plans for the MUD property off Lohmans. Here's the agenda. Went to a BSW Hospital Advisory Meeting January 24. Great discussion on ways to improve the already great service our hospital provides. Good discussion and some new ideas! I appreciate their willingness to continue improving! Well, today's the Super Bowl! The Saints should be playing and aren't because of a lousy call but I can't wait for the commercials. Be careful and have fun! Don't forget, I do Web Hosting if you need a web page or just special email addresses. Check out JB Hosting or send me an email with questions. I also do aerial photos - roof inspections, Real Estate, Construction and more - see Sky Pictures or email me! As always, if you want to be added to my email list, send a note to lakeway@bain.us and I'll make it happen. Have a GREAT day and enjoy our wonderful city.